Members of the Fraternal Order of Moai have diverse interests but we all agree on the value of good works. The Moai in South Florida share an interest in supporting animal shelters. 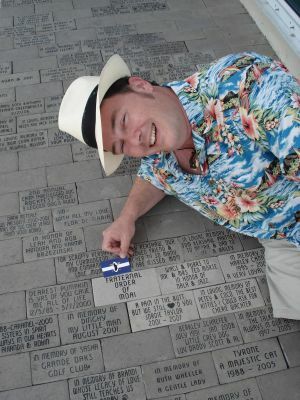 When the Humane Society of Broward County was raising funds by building a memorial "Paw Pathway" the Gumbo Limbo Chapter decided to raise funds for a brick in the path in their own unique way. Funds were raised several ways. First up was an auction of signed, limited edition tiki mugs by longtime tiki carver Ben Davis (aka Benzart). Ben says a double Mai-Tai will taste so much better in this mug knowing that you helped out a good cause. Next chapter members designed and sold hand-crafted tiki mugs. And finally the chapter sold custom made Traveling Bar Rolls for the mixologist on the go from Fashion Tramp. 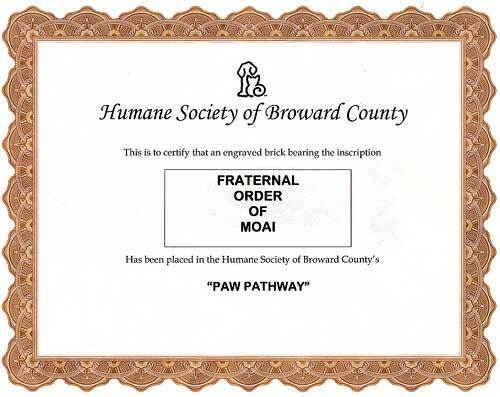 After six months the project was complete and the Fraternal Order of Moai is a permanent part of the Paw Pathway. In a letter the executive director of the society thanked the chapter, saying, "we are extremely grateful and proud to have this tribute to your love of animals as part of our building."